The AutoCAD 2017: A Problem Solving Approach, 3D and Advanced textbook contains detailed explanation of AutoCAD commands and their applications to solve design problems. Every AutoCAD command is thoroughly explained with the help of examples and illustrations. This makes it easy for the users to understand the functions and applications of the tools and commands. 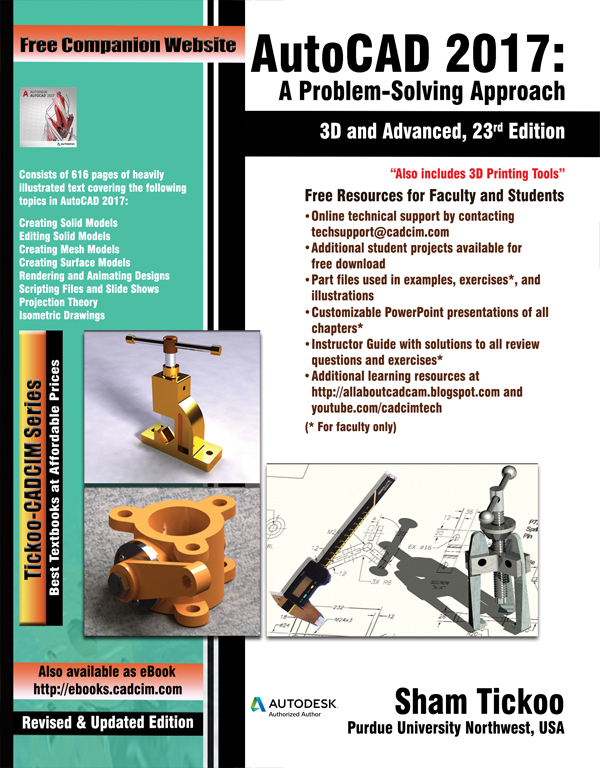 After reading this textbook, you will be able to create 3D objects, apply materials to objects, generate drafting views of a model, create surface or mesh objects, and render and animate designs, and understand 3D Printing. The book covers designing concepts in detail as well as provides elaborative description of technical drawing in AutoCAD including orthographic projections, dimensioning principles, sectioning, auxiliary views, and assembly drawings. While going through this textbook, you will discover some new unique applications of AutoCAD that will have a significant effect on your drawings and designs. The textbook also covers the 3D printing tools introduced in AutoCAD.